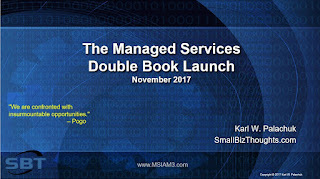 Small Biz Thoughts by Karl W. Palachuk: Double Managed Services Book Launch is LIVE! The Double Book Launch is LIVE! The launch site is live at www.msiam3.com. 1) This is a “Pre-Sales” Launch. Ebooks will go out in December. Paperbacks will ship in January. 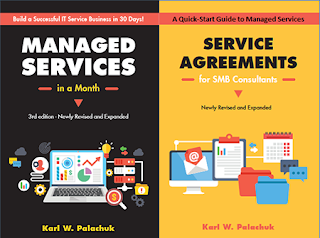 2) If you bought Managed Services in a Month or Service agreements for SMB Consultants since July 1st, 2017, you are eligible for a FREE copy of the new book. If you bought from us, we have a record and we’ll send you the book when it’s available. If you bought from Amazon or somewhere else, be sure to register your book at www.smbbooks.com. Again, we’ll send you the book when it’s available. 3) If you choose Option One (just the books), the ebooks and paperbacks are sold separately. ALL other options include both the paperback and the ebook. Here are the options. I am REALLY excited to pair up two new classes with the new books. 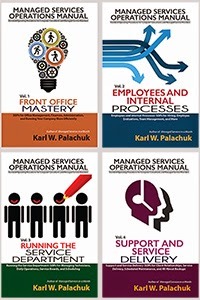 New Book: Managed Services in a Month 3rd Ed. 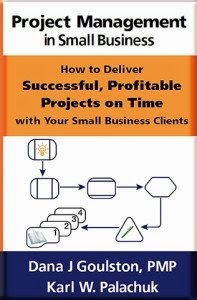 5-week Class “Service Agreements for SMB Consultants – Applying the Book"
Lots more information at www.msiam3.com.